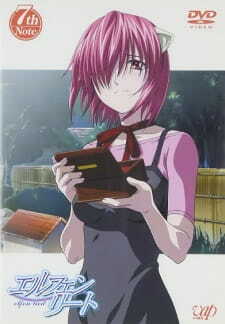 Taking place within the events of Episode 11 of the TV anime, the Elfen Lied Special combines an anime-exclusive story and a flashback arc from the 10th volume of the manga it is based on. Well, I went into this expecting a continuation of the ending. I was very disappointed in that regard, as this ends up taking place during the series, and doesn't do much of anything to resolve some issues that were left unexplored. It's more an exercise in light-hearted comedy with minimal background information (the only useful thing we really find out is how Lucy got captured in the first place). At times, this feels like another series entirely. The art and music and seiyuu rawq just as much as they do in the series proper, so I'm not going to elaborate. All in all, a nice side story, but I would've liked to have seen more exploration of the ending, or at least resolution of some of the hanging plot threads. Well, I guess this episode was supposed to clear things up a bit, but for me it didn't even get close to doing that. In my opinion, this episode is pretty much useless.But since it's Elfen Lied, it's good. I was really expecting it to be a continuing of the ending, since it left so many unanswered questions. I'm hoping there will be a second season sometime, but that seems improbable. The "Elfen Lied" DVD special feels like an attempt to do a "quick fix" on the story that they botched up in the original series. This attempt resulted in somewhat mixed results. On one hand it does succeed in shedding some much needed light on certain events, such as the capturing of Lucy, however on the other vector, the explanations feel like they've been shoehorned in, resulting in inconsistencies in areas such as character development, and raising almost more questions than it answers. This is inline with what I would expect from "Elfen Lied" though, given its track record of throwing in large scale twists and backstories without carefully considering their impact on a wider scale. This isn't going to change your opinion on the series either way though. People who liked what they saw in the series will want to check this out because of the extra background it provides, and people who did not aren't likely to have their minds changed by this offering, given it has pretty much all the flaws of the original. Its basically a crime that this wasnt included in the show originally , since honestly this is probably the best episode of the show . The episode has easily the best mixture of drama and comedy . Its doesnt try to emotionally manipulate you with constant meanspiritism and bloodshed like episode 9 did . The only time there is killing in the episode , its well executed and the creators atleast let the character go with some dignity instead of exploading her into pieces . The comedy is definetly the best part . Its a greeat mixture of lighthearted to kinda dark , wich sums up the shows comedy in a whole. Overall its definetly a must watch for the fans.